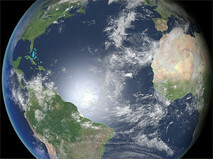 Reach and Teach: Want to Save Money, Lower Your Footprint on the Planet, and Feel Good? Read on! Want to Save Money, Lower Your Footprint on the Planet, and Feel Good? Read on! At Reach And Teach we try our best to be mindful of our impact on the planet every day. We're always looking for ways to lower our footprint, save a little money, and feel good about the choices we make. Way back when co-founder Derrick Kikuchi was at Hewlett-Packard, engineers were always encouraged to think about the person sitting right next to them, at the "next bench," whenever they were working on designing a product. Thinking about someone you know, sitting right next to you, and basing your decisions on what impact the product will have on her life, her work, her planet, can help you make better decisions and design better products. Also, think about the impact your design decisions will have on you if you were to be the user of the product. We apply that thinking at Reach And Teach, seeking products that we will personally use and which we think will benefit you, our neighbors. Earth Day is April 22nd but we like to think of every day as Earth Day. With that in mind, in this post we'll share some of the ways we reduce, reuse, and upcycle. And... in doing so we're more frugal (saving money), green, and happy! We invite you, our neighbors on the next bench, to join us. Here's the deal...... we love to cook. And, when we cook, we like to make enough to last several meals and we end up using a lot of plastic wrap. Whether we're wrapping rolls of sushi or lasagna or bread.... we want to keep what we've cooked large batches of so that we can have meal after meal after meal after meal. Every time we take that wrap off something we've cooked and saved, we toss it right into the garbage. What else can you do? So, this year, we asked ourselves if there was any way we could find to use less plastic wrap and..... good news!!!! We discovered Bee's Wrap! Here's how the fine folks at Bee's Wrap describe themselves. This is where Bee's WrapTM enters. Enchanted with all the shades of muslin, old flour sack, scraps of trimmings, lace, yarn, and given some invaluable suggestions from family and friends, I found that by coating it all in beeswax my creations became functional! The combination of fabric infused with beeswax, jojoba oil and tree resin made for the perfect alternative to plastic for food storage. The antibacterial properties of beeswax and jojoba oil help keep food fresh and allow Bee's Wrap to be used again and again. Bee's Wrap evolved into a basic food storage product that was easy to clean and use, that we could make available to many people, not just our own households. The comforting and uplifting scent of melting beeswax filled our home for months. Now, Bee's Wrap is made in its own shop by myself and some wonderful women. We are thrilled to be able to share this new product with you and hope you find it as useful and enjoyable to use as we do! So, stop using and tossing all that plastic wrap and try Bee's Wrap. Click here to buy some from Reach And Teach. If you had to guess what made up one third of all landfill waste what would you guess? Go on, take a few moments and think about that one. Believe it or not, the answer is..... paper towels! Wait what? But.... I only use a few of those a day, you might say. Nope. The average person uses 100 rolls of paper towels a year. When we were working on "greening" Reach And Teach, we looked at all of our daily habits at work and at home and one of the things we quickly realized was how often we went for the paper towels for quick cleanups. Why? They're convenient, relatively cheap, and we figured we could toss them in the compost bin. If only. It is a European made product packaged in the U.S. and 100% biodegradable when properly composted because it is made from a natural cotton and wood-based cellulose pulp. 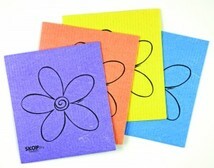 The Skoy Cloth is a chlorine-free, unbleached, and non-GMO product using water-based colors and inks. After an independent composting test, Skoy Cloth broke down completely within 5 weeks. The Skoy Cloth is a durable product due to the reusability factor and can last months. The Skoy Cloth has an absorption factor of 15x its own weight. As a result, producing the most superior cloth product available. Imagine using 15 sheets of good-quality paper towels at once... This is how a wet Skoy Cloth will feel in your hand. If you'd like to try Skoy Cloths for yourself, click here to visit our web store. A Problem: Quick Trips to the Grocery Store And... Bags! There's a big, giant, bag in our garage, filled with... plastic bags, the kind we used to get all the time at the supermarket, before we became enlightened enough to start carrying our own reusable bags everywhere we went. A few years ago when Cool Cities San Mateo began meeting in our shop one of their big goals was to get a law passed requiring merchants to charge ten cents for every bag a customer needed. Just ten pennies, one dime, could make people stop and think and learn new habits. Cool Cities succeeded and judging from the number of people saying "no" when we offer them a bag for a dime, and more importantly the number of people who always carry a reusable bag with them, the law is truly a success. And, in case you are wondering what to do with your giant bag full of plastic bags from the bad old days before you were enlightened, most supermarkets have recycling bins for those bags. Typically, they CAN NOT go in your normal big blue bin at your house. Those bags require special handling so please find a place that truly does have the ability to get them recycled. Way back in the day, when we first started Reach And Teach, we were speaking at a gathering of seniors (folks in their 70's and up) about our new venture and the person who invited us told us it was a bring-your-own-bag lunch, but that we shouldn't bring our own, she would provide our lunch. She'd made us delicious sandwiches, home-made cookies, and she gave us our lunch in something we'd never seen before... a ChicoBag. 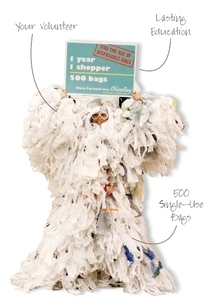 Andy Keller, who invented ChicoBags, is one of the people we credit with helping to educate the public about the environmental harm caused by single-use bags. He created a bag that you could always have with you, that folded up into its own attached pouch, and with the addition of a carabiner (metal loop with spring-loaded gate), allows you to attach your bag to your belt or purse so it is always handy. 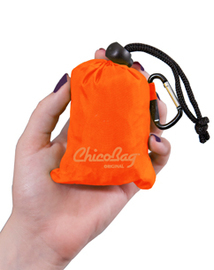 Click here to order ChicoBags from us. One of the most damaging habits Americans have fallen into is the use of plastic water bottles. You've seen folks walking out of your local supermarket with literally hundreds of plastic bottles of water, or maybe you've actually been one of those people. We've got to admit, there were a few events in the last five years where that seemed like the only good option for making sure folks had access to water. The impact of plastic water bottles on the planet and on our wallets is staggering. Our friends at Klean Kanteen support the important work of 5 Gyres Institute. To understand the impact of plastic pollution, 5 Gyres studies the five subtropical gyres by sailing through them. Unlike other ocean conservation organizations, 5 Gyres doesn't just take scientists out into the ocean, they take artists, writers, musicians, journalists, students, teachers - anyone who will serve as a 5 Gyres Ambassador for change. The goal is to give stakeholders from all walks of life an authentic vantage from gyre central. Check out their video. A Klean Kanteen water bottle costs just $20 and the water you'd need to fill it from your tap (even filtered) over and over and over again all year long is just $0.48 cents. Frugal + Green = HAPPY!Whether you're heading out for a short hike or giving a big presentation at work, the 18oz Kanteen® Classic holds enough to keep you hydrated, but is also fits easily into your bag, pack or briefcase. Available with the Sport Cap 3.0; featuring a soft silicone spout, 25% higher flow rate and "chirp" free hydration. Klean Kanteens are made from high quality, 18/8, food-grade stainless steel; totally free of BPA and other toxins. Because stainless steel itself is safe, Klean Kanteen doesn't need to coat the inside of the bottle with a plastic or epoxy lining, one of the main differences from aluminum bottles. 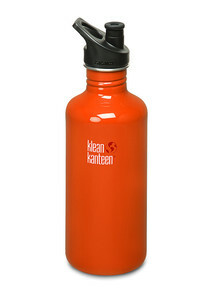 Click here to visit our Klean Kanteen ordering page. We have a dog. We have a bathroom, We have a laundry room. We have some stinky places. For most of our lives we've used various sprays to get rid of, or cover up, odors. Here's the problem with most of those sprays. They only work for a short time, they're expensive, the containers they come in can't be reused, and the science is not very clear on whether they are bad for the environment and our health. But..... we don't like stinky places! So, what can we do? After finding it at a gift show, we tested out a Moso Natural air purifying bag when we noticed that our car was beginning to smell way too much like our dog. Following the simple instructions that came with the bag, we put it out in the sun for a few hours and then popped it into the back near the kennel and when we got into the car a few hours later, no more dog smell! We were sold. We've had the bags in various sizes available in our San Mateo shop and have gotten great feedback from lots of other customers. "My son's room was really bad. I put the Moso Natural bag in the sun for a few hours and then carefully opened my son's bedroom door and tossed it all the way in. The next time I opened the door, I could breathe! The Moso Bag is a safe alternative to air fresheners that are filled with formaldehyde, petroleum and fragrance, which can be carcinogenic and lead to numerous health problems. 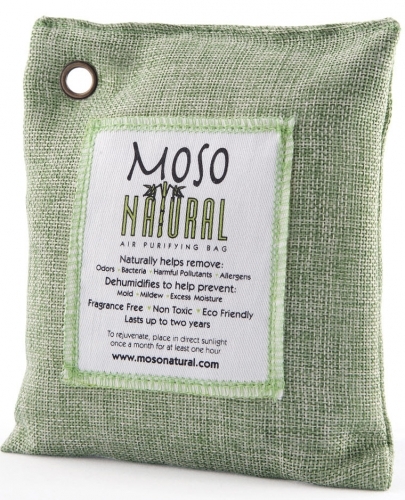 The Moso Bag is filled with non toxic, chemical free and fragrance free moso bamboo charcoal that allows your family and pets to breathe safely. To use, simply place the Moso Bags in or near the effected area. Within a short time (usually less than 1 day) the effected area will be fresh, dry, and odor free. With simple maintenance the Moso Bags are reusable for up two years! Most common air fresheners, in addition to being ineffective, don't last more than 45 days. Once a month, place your Moso Bag outside. The UV rays from the sun will clear out the pores of the bamboo charcoal, making it ready to absorb again. After two years as an air purifier, the Moso Bag makes a wonderful addition to your garden. Simply cut open the Moso Bag and sprinkle the bamboo charcoal into the soil, where it helps plants absorb moisture and nutrients. This completes its lifecycle as a product that comes from the earth and ultimately gives back to the earth. Click here to learn more about and purchase Moso Natural bags. A Problem: We Recycle But What Really Happens to That Stuff? We love our blue bin but we know that in reality a lot of stuff that's supposed to be recycled never actually gets used to make anything else. Or, stuff that we recycle here has to get sent as far away as China and the fuel required to send stuff all the way there and products all the way back.... well, that's not really very good for the environment. Over the last few years we've found more and more wonderful products that are upcycled, cool new products made from recycled materials. 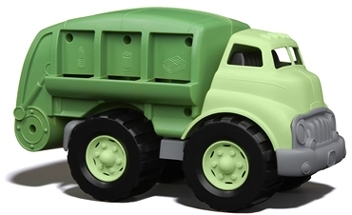 Among our favorites are Green Toys which are made in our own backyard near San Mateo, from recycled milk jugs, which are BPA-free making them safe for kids and the planet. We also have upcycled jewelry, wallets made from recycled inner tubes, purses and glass cases, and more. Click here to check out our Green Toys products. Click here to check out our upcycled wallet. As always, we're grateful to all of our partners in peacemaking who help us on our journey towards a more peaceful and sustainable life! If you're in the San Mateo area, stop by our shop, Reach And Teach, at 144 West 25th Avenue any time and we'll be happy to give you a tour and show you the latest things we've discovered AND please let us know about products you use that help you lighten your footprint on the planet.